Franz von Lenbach (1836-1904) and Otto von Bismarck (1815-1898) became friends in the 1870s. Thereafter, the artist portrayed the statesman about 100 times. 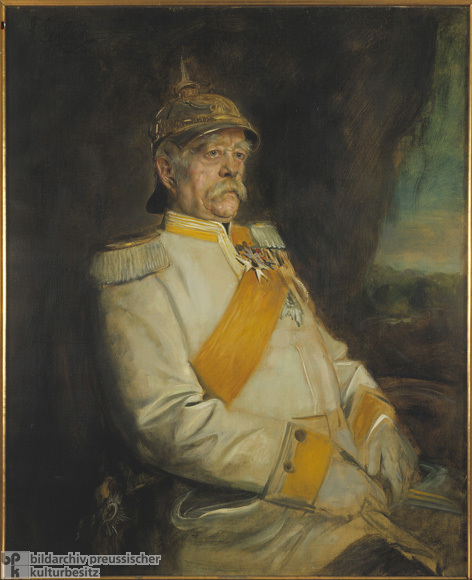 Although this painting shows Bismarck past his physical and political prime, it still conveys the reverence the portraitist felt for his subject. Bismarck is shown wearing his ceremonial white Cuirassier uniform and Pour le mérite medal. Original: Privatbesitz. Photo: Jürgen Liepe.